In 1998, soon after assuming the presidency of Tulane University, Scott Cowen was confronted with a setback. Despite an undefeated football season and putting the best financial deal on the table, Cowen was unable to retain the school’s football coach. The coach wanted something the president didn’t have–a football program so popular, as the coach put it, that fans would line up their Winnebagos on Wednesdays in anticipation of Saturday games. In that moment, Cowen improbably found himself in the entertainment business—and his university was deemed wanting. 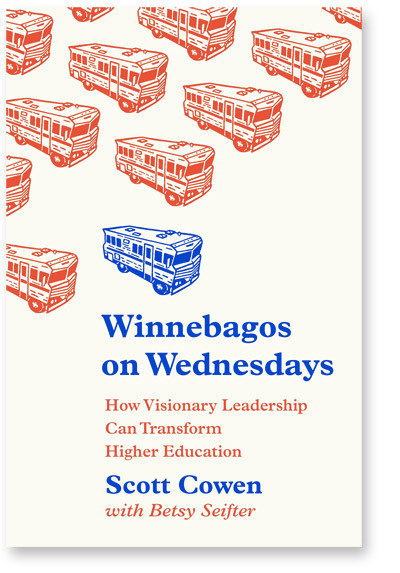 At a time when schools seem overrun by sports programs, spiraling costs, and absurd ranking systems, Winnebagos on Wednesdays argues that colleges and universities of all stripes and sizes can achieve their educational aims if they possess two things: visionary leadership and a strong mission. Cowen, named one of the nation’s top university presidents by Time magazine in 2009, gives a behind-the-scenes look at the critical demands faced by many education leaders. He profiles a range of situations, from how Diana Natalicio of the University of Texas at El Paso expanded a school serving a specific demographic into an academic powerhouse to how Michael Sorrell shifted Paul Quinn College’s mission to urban entrepreneurship in order to save the institution. 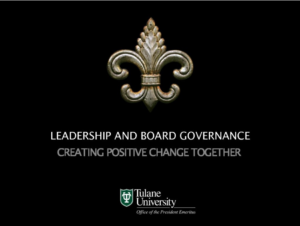 Cowen also draws from his own hard-won experiences, including the rebuilding of Tulane and New Orleans after Hurricane Katrina and the decision to maintain Tulane’s football program. He shows how crucial choices in tough situations shape organizations, for better or ill.
Winnebagos on Wednesdays will be published on February 21, 2018. After seven years as the president of Tulane University, Scott Cowen watched Hurricane Katrina devastate his beloved New Orleans. When federal, state, and city officials couldn’t find their way to decisive action, Cowen, known for his gutsy leadership, quickly partnered with a coalition of civic, business, and nonprofit luminaries to work around the old institutions and save the community. Cowen has continued this work ever since, helping to transform the wreckage into a hub of social progress and economic growth. The Inevitable City outlines the ten principles that changed the game for New Orleans, and that can do the same for other communities struggling in the wake of disaster—whether natural or man made. With Detroit’s historic bankruptcy, the problems of urban America are clearer than ever—just as government paralysis hits an all-time high. It’s up to ordinary citizens everywhere to tackle the problems plaguing their own neighborhoods —including crime, poverty, and failing school systems—and rebuild the worlds they once knew. 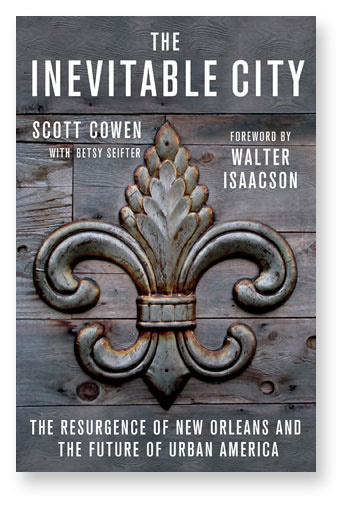 Here, Scott Cowen reminds us that leadership is the ability to see a future that does not exist and to work with others to realize it, as he did with the people of New Orleans. The Inevitable City is available for purchase at local and online retailers. Fortune – Was Hurricane Katrina Good for New Orleans? July 13, 2018 – Project Syndicate – Is Trump an “Effective Leader”? July 11, 2018 – Higher Education Today – Want to Be a Really Effective Trustee? May 3, 2017 – Huffington Post – Where Are the Leaders?